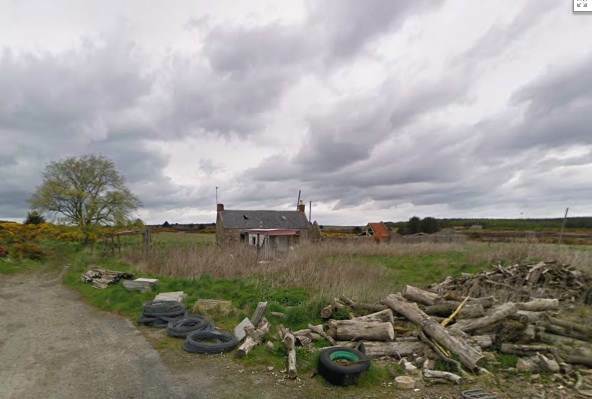 The cottage at Mosside croft, home of my Fraser ancestors, was built of stone with a slate roof and is next to a stone walled steading (barn), but as the Frasers lived there from about 1840 I doubt these were the original buildings. Studying old maps has helped me pinpoint when the now derelict croft buildings might have been constructed. There seems to be one long building with a much smaller one behind it. 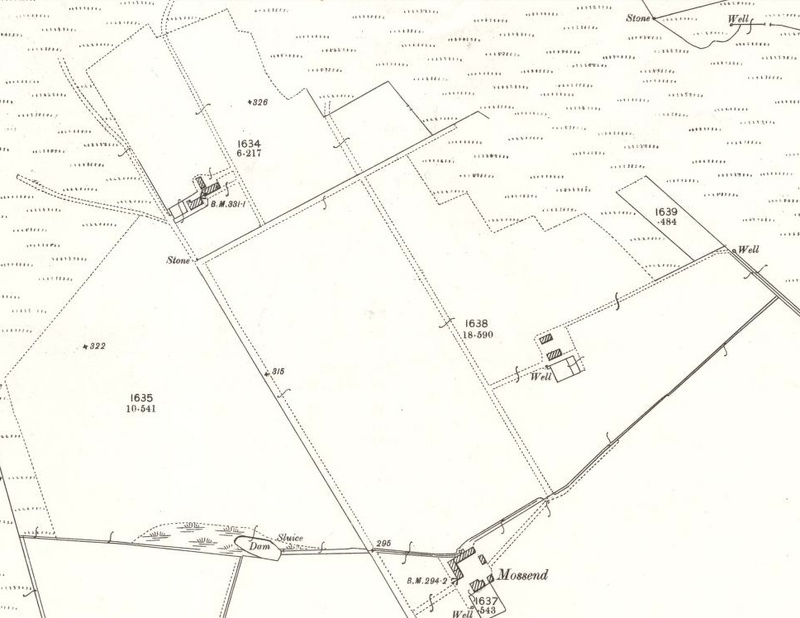 Below is what appears on the OS 25 inch map surveyed in 1899, this time numbered BM 331.1. What I know as the cottage is now there, but it wasn’t in 1872. This seems to be convincing evidence that the stone cottage with the slate roof that’s still standing today was built some time between 1872 and 1899. This is interesting, as my gg grandfather Alexander Fraser took over the croft when my ggg grandfather William Fraser died in 1877. Perhaps it was Alexander who rebuilt it. This leads to the question: what were the Frasers living in before then? There would have been one long low building, as shown on the 1872 map, divided into two – the people lived and slept in one half and the animals had the other half. It would have been built of rough stones, with a roof thatched with turf or heather. The floor was most likely dirt, perhaps incorporating some stone. Originally an open fire would have been in the middle of the floor, with an opening at the centre of the roof for the smoke. Chimneys came late to Scottish crofter’s cottages. All in all, it was primitive and not very comfortable – and no doubt damp, dark and smelly. This means that in 1861 the old style, possibly one roomed cottage accommodated a household comprising William and his wife Christian, in their 50s, 2 of their adult daughters, their youngest son age 11, 5 grandchildren aged from 16 months to 6 years, and the pauper boarder John Black age 29. Where on earth did they all sleep? How did they feed them all at meal times? When the new cottage was built, it looks as if the old one was converted into a steading, and the people and the animals finally had their own buildings. But the new cottage only had two rooms downstairs and one attic room upstairs so it wasn’t exactly large. When my mother went there for summer holidays in the 1920s, there would have been 10 people to be accommodated. My suspicion is that young men and boys still slept with the animals, and were bedded down in the steading. Today I came across a marriage that very nicely rounds out my research into illegitimate William Fraser. William’s mother, Janet Sangster, married William McWilliam and her illegitimate son seems to have been brought up by her and her husband, along with their own children. 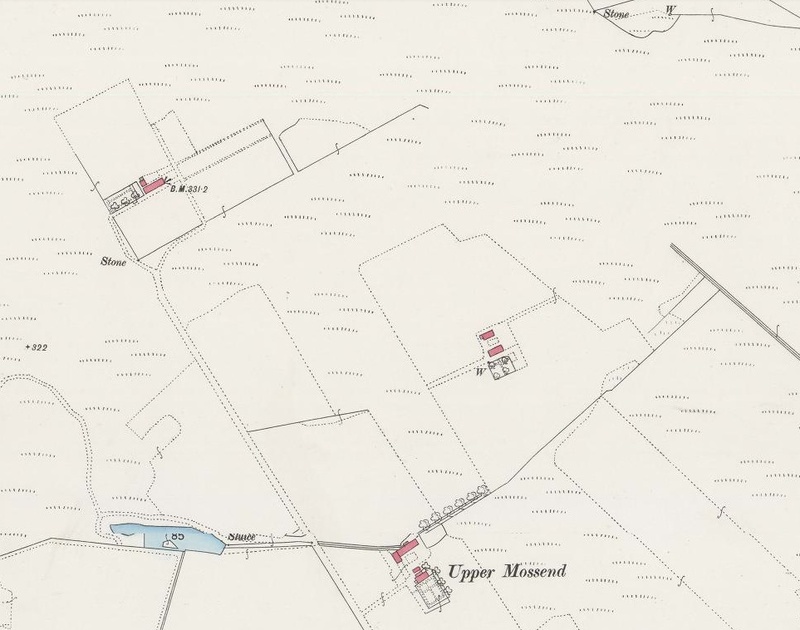 William Fraser took on the lease of Mosside Croft, just a few fields away from where his mother lived, and eventually the croft was taken over by his son Alexander and then his grandson William. William the younger married and had children, then tragically his wife died. But, as most men did in that situation, he remarried. His second wife was Helen Ann Morgan, who my mother remembered from her childhood holidays at Mosside Croft. I’ve often noticed that second wives seem to be linked to the man’s family in some way, and can’t help wondering whether the family looked around for someone suitable to act as housekeeper and, when nature took its course, as wife and mother of more children. So did William and Helen know they were related? For they were – their great-grandmothers were sisters. 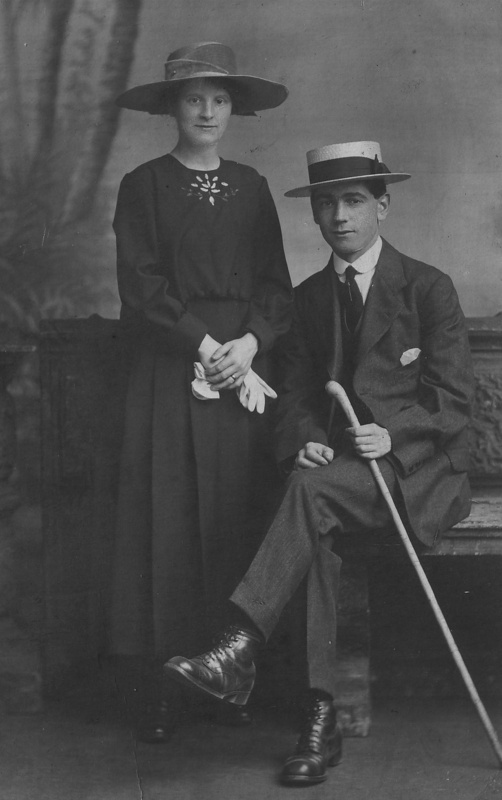 William Fraser, great-grandchild of Janet Sangster, married Helen Ann Morgan, great-grandchild of Janet’s sister Isobel Sangster, who had married Peter Morgan. So it turns out that the step great-grandmother I didn’t think was a blood relation turns out to be a relative after all, albeit distantly. The Peter Morgan who married Isobel Sangster back in 1815 was, I suspect, the son of George Morgan and Margaret Logan. Janet Sangster’s grandchild Alexander Fraser married Mary Ann Logan. I’ll have to do more research on her and see if she was related to Peter Morgan’s mother!